All of the love, learning, and fellowship of the weekend came together as we meditated on an experience many of us had never had before. For me, this was something different . . . This past weekend, I had the pleasure to share space with over 80+ young black gay men from all over the country. They came from the swamps of Louisiana, the hills of Kentucky, lowlands of Georgia, and even the capital of our nation. They came from academia, HIV prevention and advocacy, activism, marketing, public health and ministry. They came with their pain, their struggles, their feelings of isolation, their hope, their joy, and their fellowship. We came to Baton Rouge as strangers, but left as brothers. I must admit, I was not really “all-in” with the conference for the first couple of days. Throughout my experience, I have not had the best moments with young black gay men and black men, in general. Though I identify as a Black same-gender-loving man, I tend to stay away from the circles of black gay men. I have been taunted, abused, intimidated and hurt by the men whom I consider peers. I brought all of that into that space. As I proceeded to press my way through the crowd and talk to people (alcohol helped), I found something striking. I had stayed away from these spaces, not because of my pain and hurt of the past, but because these spaces did not exist. It was very rare for black gay men of all backgrounds to come into one room with the intention of loving and learning from each other. It was rare for black gay men to come into the room with all of their identities on display, vulnerable to their brother, and ready to simply be. We came to Baton Rouge as strangers and because we sought love and joy within each other, we left as brothers. God was present in the room this past weekend with these brothers. God showed their face as we broke to heal. I will forever be grateful for that space and be charged with the duty to recreate that space wherever the spirit leads me. Personal Point of Reflection: Open my heart. Lead me, Holy Spirit to where I need to go. There’s something about this day that always gets me. This day celebrates the resurrection of a man folks thought was dead. A man folks wanted dead. A man who healed the sick. A man who raised the dead. A man who gave hope to the hopeless and peace to the troubled. Because on this day, the victim became the victor. The downtrodden became the triumphant. The dead became alive. I guess it gets me because it promises me that though I may suffer in a present moment, there is hope, there is life and it is everlasting. Glory to God for the Savior lives. Glory to God for we live. Glory to God for the oppressed are free. Glory to God! Hallelujah. We can live. Freely. Yes, today is Good Friday. Yes, today we remember that bloody moment of crucifixion. But what does that mean for us today? Jesus was MURDERED by the Roman Empire for being a trouble maker. He was persecuted by his Jewish religious leaders for being a religious dissident. Jesus was a black poor Jewish man from Nazareth, the “hood” of Jerusalem. They legally sanctioned this lynching, just like whiteness and empire did with black bodies over the course of our 400 year history in the Americas. Today, it is sanctioned through the murder of black bodies by police. Today it is sanctioned by the scores of black people beholden to poverty and poor living conditions. Today, it is sanctioned by the poisoning of Flint’s residents. Today, the same conditions that MURDERED Jesus are still in place. On this Good Friday, I choose to remember these conditions and reminded that Jesus calls us to victory over these things. I choose to remember that these things do not have power over God’s anointed: the oppressed. I choose to commit to working to tearing down these institutions of empire, white supremacy, sexism, homophobia, transphobia, and more that seek to restrict people from accessing the Kingdom. This Good Friday, I’m encouraged that death does not have the final say. That we shall rise again through the power of God and through the example of Jesus’ resurrection 2000 years ago. Just some thoughts on growing up in the black church. This is a direct assault on all of the things that traditional/evangelical church knows of Jesus…I love it!!! Let me start: I am not a theologian; I am not an aspiring clergy; I am not even a Christian. However, I recognize that I am an expression of the divine (however you imagine her). My perception of Christ and Christian theology has changed over the last months. This is a snapshot. Mya died and remains dead because of our sins. And, she waits in the tomb, waiting to be resurrected. Sometimes, we take selfies and do not recognize the kind of symbol which is present in that endeavor. A selfie is bigger than me taking a picture of myself. A selfie is a type of self-affirmation of the beauty and poise in being my authentic self. A selfie is an exercise to express my soul. The “Selfie” really came of age when the President of Denmark took out her cell phone at the funeral of Nelson Mandela and took a selfie President Obama and Prime Minister David Cameron of Brittan. Although many in the news media seemed to be caught off guard, and others thought it to be really “Cool”, for many others around the world, they were participating in an activity that takes place in almost every corner of the world – taking a picture of yourself and maybe a friend or two with your cell phone. The “Selfie” is made possible by incredibly sharp, high megapixel cell phone cameras. Many of the modern cell phones have two or three times the number of megapixels as my Nikon D 7000 Camera. As I have considered the “Selfie” several thoughts come to the forefront. 18 There is no fear in love, but perfect love casts out fear; for fear has to do with punishment, and whoever fears has not reached perfection in love. Love is unity. Love is the highest connection for which humans connect. Love is that thing which cannot be explained, because we cannot always explain our complex feelings surround love. Humans are complex and often ambiguous in thought compared with actions. To be a human means that we can somewhat formulate our expression of love for others and for ourselves. The complexity surrounding love is a reflection on our own complexity and provides light to how interconnected humans really are. In order to understand love, one must understand humans. In order to love, one must understand oneself. In the scriptural passage above, the author expresses what perfect love looks like. Specifically, the author recognizes how fear should not be present in the midst of love. Love at its core does not involve fear. 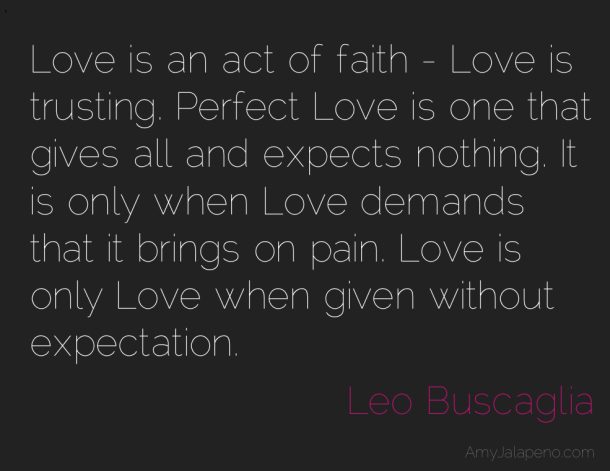 But, the major case that the author makes here is that PERFECT love has these characteristics. Perfect love is not easy to accomplish. Quite frankly, perfection is never easy to accomplish. We strive toward perfection every day. Despite our issues and complexities, love exceeds and can live perfected.